the phone cover is a great product. The phone cover is exactly what I hoped it would be; protective with good storage for cards, and a snap shut arm. Very well made product. A little bulky. It is a little bulkier than I was expecting. Very happy with my purchase- took a long time to arrive but worth the wait. Quality product. Delivered as advertised. Nice case very soft leather, and a nice fit for my S9. Phone case as described, simpleand functional ,not too bulky. It holds 4 cards, some notes although I haven't check space for coins. I am delighted with it. I feel my phone is safer. It's less hassle having cards and phone in one place. This order arrived promptly, no hassles. The case is of good quality and is exactly as described. It appears to provide good protection for the phone's corners, edges and screen. I'd recommend it. Very good quality and would definitely recommend. 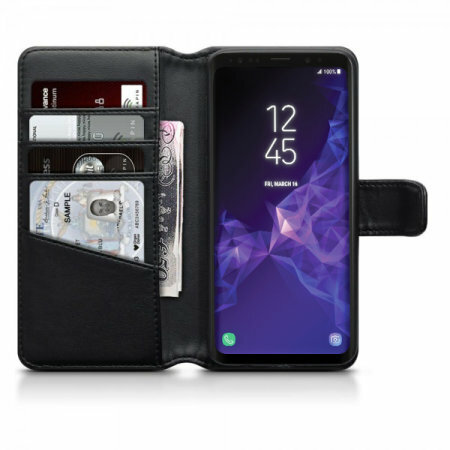 I spent ages looking into wallet cases for S9. This was my pick because it seemed good quality. The Good: It is good qulaity. Even stitching. Easy access to the fingerprint scanner. The credit card slots work a dream and 1 or 2 piece of paper/notes fit in the cash section. The Bad: VERY thick. Cannot access volume button with case closed. Overall: I have used this in Finland at -22C and it protected the phone from the cold and 1 drop. I always know where the phone is but it is just too bulky for my liking. I am getting something else. Real leather Samsung SO and card holder. Magnetic closure and a magnet to hold the flap secured when fully open are very useful. It holds 4 cards visible when you open the flap. There is room for bank notes or 2 or 3 more cards behind the front cover. I tried to squeeze 1 more card in it but then it's a big stretch to close it. Very nice buy. Phone sits securely inside rubber holder. Buttons are integrated into the rubber - some other covers have only cutouts. It's showing light signs of use on the corners. Really smart, nice quality product. Handy as don't need to take a purse always with card and wallet section. Secure magnet clasp. Take care as the leather does mark /wear if it catches anything sharp in your bag/pocket. Whether the phone model will fit in the wallet case with a clear screen cover/protector. Also would have been handy if you could have supplied this as a separate item. Good quality. Useful 4 pockets for cards etc. Very happy with my purchaseâ€¦.Practical, Stylish and Durable ...just what I wanted. Thanks MobileZap will certainly be back. So pleased with it great value for money. Delighted with the case for thr S9 shame the phone itself was a month starter, had to send it back. Now I have a great case and no phone. But I would recommend this companies products without hesitation, great product with a really nice leather aroma. Easy access to all buttons camera etc, no need to carry a wallet anymore. I wouldn't have bought this if I'd known how bulky it was on the back i subsequently bought a different type of case. Bought this item, excellent quality and arrived in the time specified. This case fits the Galaxy S9 perfectly & is of excellent quality. It protects the phone, has a magnetic closure tab and looks good too. As always good quality products at reasonable prices too! do you know the next lotto numbers? Ha ha! Your description on internet was good enough! This was my third attempt at getting a wallet style phone case. The first two looked right online, but when received there was only two card slips and no inside note holder. Not to mention the clasp barely closed. This one was delivered quickly and was exactly what I was looking for. Well made, 4 card slots and a place to keep a few notes. Can't fault the price either. My own fault for buying it, obviously, but this case doesn't suit me. It's great if you want to ditch your wallet and don't access your phone often throughout the day. The leather seems like it would take bashings and the phone would be protected. There are a disadvantages which I wish I'd considered before buying. The lack of access to volume control buttons means you have to open the whole case up to adjust volume. The case is also too heavy to take a picture with one hand. Yup, it does the trick just like I wanted it to do. Had the case for not very long .The case clip has split already can not be real leather just rubbish . I would have liked to know that it would actually fit my phone. I had purchased one for my S7 last year and it fitted perfectly. This S9 cover seems too small to close. It has the inside pockets I like. Feels like leather when some other products don't. Insert for the phone fits perfectly and feel like it will do the job of stopping phone from bouncing out when i drop it. Very smart cover. I like the slots where you can put your credit cards. It does what it says on the tin. S9 leather wallet with just enough pockets for the plastic cards. Feels well made not one of the shoddy wallets so should last a few years . Loved the colour by the way. It arrivesdby royal mail within the allotted time . I have just upgraded ,So needed a case similar to my previous ones that held cards. It was exactly what i wanted and the quality is great. I can highly recommend the case. The leather and stitching is very good quality and the phone fits perfectly with good access to all of the buttons. Arrived when stated and was as described,,very pleased,,would buy again from mobile fun. Brillant case and fit for purpose, dispatched on time and recieved 2 days later ,excellent service. Does everything it should looks pretty good too. Material is solid and feels nice, magnet clasp works well and I like that there's also a magnet to help the case shut backwards when it's open to use. Fits enough cards and the extra pocket is useful for cash. Great cover for my Samsung Galaxy 9, well made and offers decent protection with the added assistance of pockets to store cards or cash in along with the phone, very pleased with this purchase.